There are lines everywhere, and we have experienced them here in Lebanon. There was a huge line when we arrived at the airport with multiple other flights. We cued up, snakelike, in the immigration line as we each waited our turn for that Lebanese visa stamp. 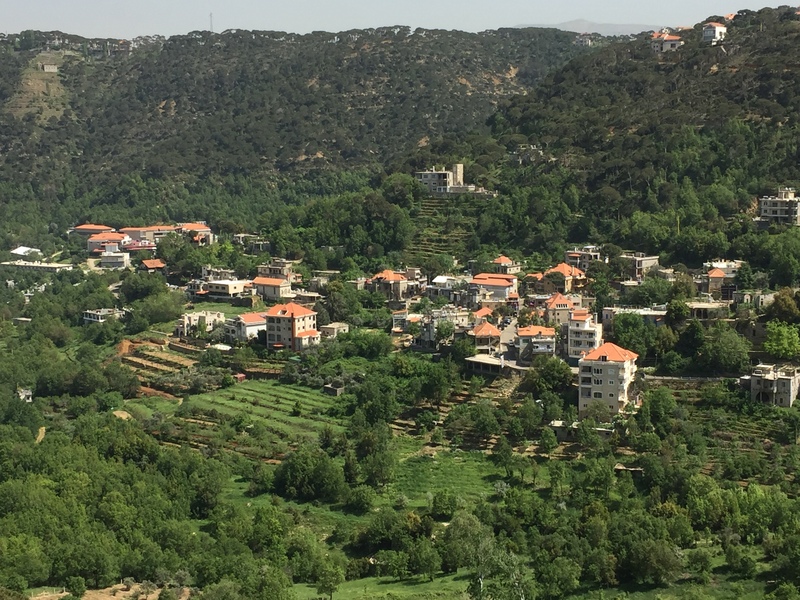 There are lines on the hillsides, terraced garden plots and vineyards, which climb up and up, fruits and vegetables all growing in straight lines. 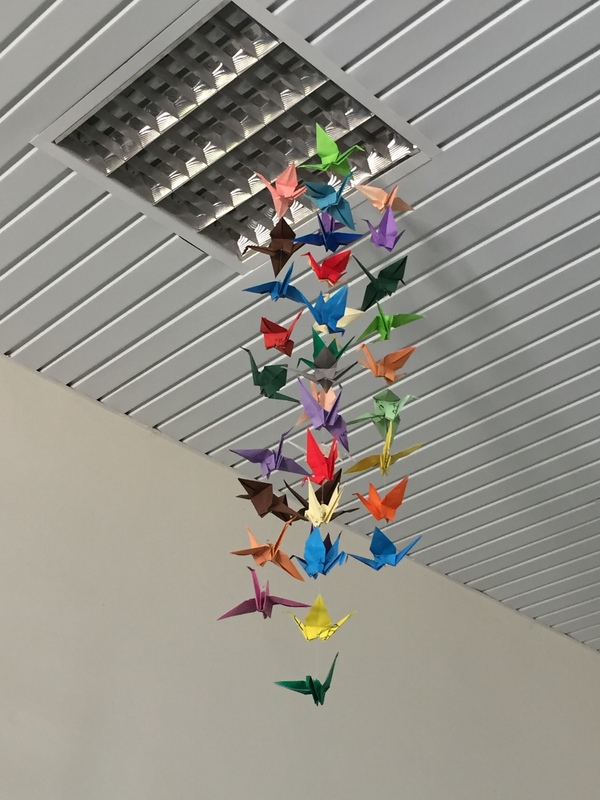 There are lines of my paper peace cranes hanging from the lights up at the conference center. There are lines of writing on paper, including the ones I captured today to fold into another crane of peace for my flock at home. 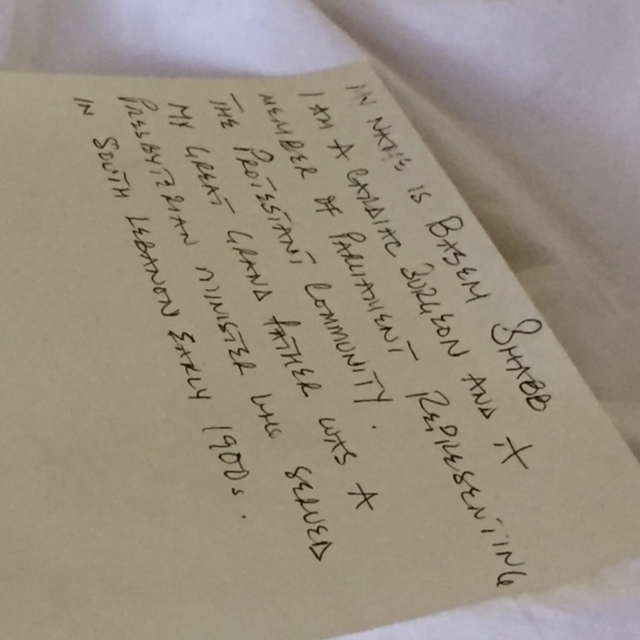 I am grateful for this one today as it came from the Lebanese member of parliament who represents the Protestants in the government, Dr. Basem al Shabb, who is also a cardiac surgeon. I am sure he sews straight lines of sutures when he closes the chest again over a beating heart. In this region there are also lines of conflict and much damage and destruction has occurred on either side of them. Almost exactly two years ago I was in Mhardeh, Syria, and posed for a photo. Behind me was a line of trees where extremists would approach to shell this city of 23,000 Christians. I was that close to the line. 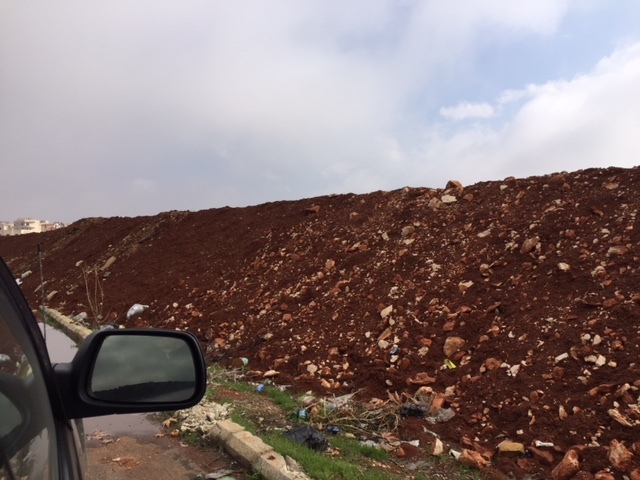 I was just as close a year ago, also in Mhardeh, when we stood next to the berm that separated Mhardeh from those on the other side who would see them destroyed. Some lines are just too hard to cross. But today we had a Bible study on the book of Jeremiah, and I am grateful for teaching that asks me to read between the lines. Rev. 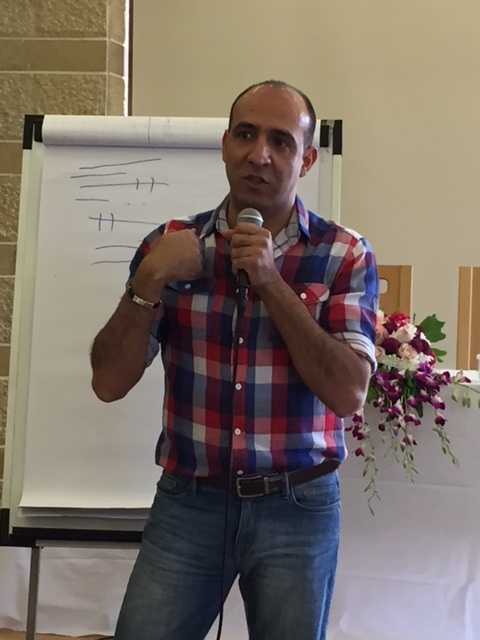 Dr. Hadi Ghantous is the Presbyterian pastor of Minyara, Lebanon, in the north of the country. He is a trained medical doctor who went to the Near East School of Theology, the reformed seminary in Beirut, and earned his M.Div. He went on from there to get his doctorate in Old Testament studies and we are all the better for his teaching. He took us through the definition and purpose of the prophets today. What is a prophet? The prophet is a person – Jeremiah, Isaiah, Micah, etc. – but the prophet is also the book we read so named for the person. The book is not totally the words of one person in many cases, like Isaiah or Jeremiah. Indeed, the history they cover provides the evidence that these books were the words of more than one person written down over decades and sometimes centuries. You might say the book is from the school of Isaiah or Jeremiah. There are multiple theologies in one book. That was a good lesson to learn. Hadi then led us to the purpose of the prophets, and here is where it got interesting, and where you can see how one book, Jeremiah in this case, has multiple theologies. What is the dominant line of theology in the books of the OT Prophets? Judgment against nations. The prophets are calling for justice, but the main theme is that God is the God of retribution, dealing with the nations like a judge. This also included Israel and Judah as well, but they had a chance to do something different, to repent. If they turned from their evil ways, going against God’s word, he would turn his angry face and return to them the blessings that came with a righteous life. The prophet is the one who speaks the word of the Lord, and a lot of that word is about judgment. Part of why we are judged is what we do in the name of the Lord, and that was the lesson for today. Hadi’s teaching on this subject did not go on long enough for me. He did go on to say that this word of true God-given prophecy was difficult to hear. More power is better! Victory over enemies is better! More guns! More war machines…in the name of God. It was so hard to hear at the time this was written down, that other writers of this word buried it with additions and corrections. But if you spend more time in this book, reading between the lines, the truth will out. When we hear the nations and our leaders demanding more planes, bigger ships, more bombs and bullets and more money for military build up, let us remember that this is not the way to true peace. It is about a peace that is in our own self-interest: our safety vs. the safety of the other. But God has a bigger idea of peace, and his true prophets will speak to that. It is a hard job because their voices are drowned out by louder ones. But if we spend some time reading between those lines, perhaps we can erase the lines of warfare and shorten the lines between the point of our hearts and those we see as the other. This is my prayer today: to read between those lines and walk the one that leads to this peace. I have had a great year as a student at Creighton University. Earlier this year, as I was fulfilling some undergraduate theology credits for my master’s program, I was enrolled in an amazing class with a professor who inspired me. The class was Theology 331, Jesus Christ: Liberator, a christology class. Here is one of the answers I gave on our final exam last May. Who is Jesus? “For me, in the figure of Monseñor Romero, Christ passed through El Salvador.” This one line in a documentary has stayed with me since I watched it. This is the Jesus I have come to know in my life, through my readings of scripture and story and narrative. 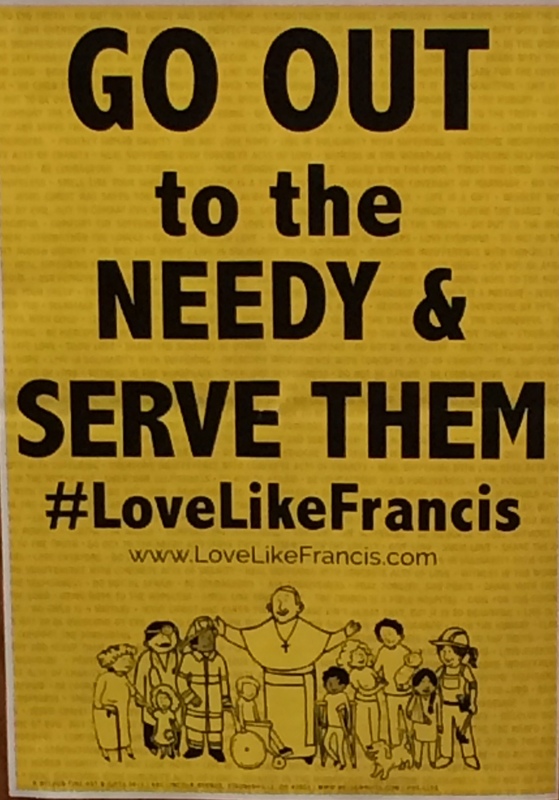 The Jesus who reaches out to those left behind or discarded. I first met this Jesus as a seven-year old whose mother had died. That poor lost little girl was tended to by three nuns when she made her first communion in second grade. They saw her grief and worry and brought her to the table. I have seen that Jesus who cares in a very special way for the poor all over the world as I have walked the halls of congress with my own disabled sister as we advocated for food and nutrition policy, for sustainable development, for increased funding for HIV/AIDS patients. I have seen that Jesus in Iraq and Syria as he walks in the refugee camps and tends to newborn babies whose parents have nothing and no one to turn to. I have heard others tell his story in the form of kidnapped and murdered priests, just like Oscar Romero. As I have participated in this class and read all three authors, I have read the words out loud to my precious husband. “Look! Do you see this? This is what I keep saying over and over! You cannot profess to love God and not love your neighbor. These two are inseparable! That neighbor on the side of the road who looks scary is obviously in need of help. We can’t walk by her like the others.” What would Jesus do seems so cliché…but how do we answer that question, cliché or not? That question and so many others rise from the depth of a heart that has not been immunized against empathy and compassion by the consumer society around me, but inflamed by the lack of justice in our laws and institutions. Sometimes it has been a lonely journey to walk. To sit in church and hear about Jesus week after week, but only in the sense that he is some kind of ideal absolute, is not what has given me cause to step out and walk with him. That Jesus is an idol, a statue on the shelf that I cannot reach. The Jesus in this class is the Jesus that asks me to open my eyes and look around to see that others need this hands-on, give-me-a-hug, wipe-my-tears-away, human contact that reminds them that they, too, are human beings, made to love and to be loved. This is the Jesus who tells me to conscienticize myself: ask the questions of why is the world like this? What have we done to make it this way? What can we do to liberate and heal it? See. Judge. Act. From my first reading of the entirety of scripture upon discovering Micah 6:8, my faith finally had the simplicity of six words to guide me: Act justly. Love tenderly. Walk humbly. This is the praxis of Jesus that his life demonstrated and I believe him when he tells me in Matthew 25 that our judgment will be based on this. Even when we don’t call on his name and step out in this way not expecting to see him in the moment, he is there, and we are loving him by loving our neighbor. This is the Jesus who calls out the rich who withhold from the poor and can’t understand how serving the common good is how we all develop fully as persons, and the hypocritical church leader whose letter-following legality keeps people out and denies them hope. This is the Jesus I have met in the community of this class. This is Rutilio Grande, Oscar Romero, Pope Francis, anyone who stands against the commodity form and sees their lonely neighbor as a person in need of human contact and comes into her life as friend. I have met this Jesus in this class and will always be grateful that I had the chance to share him with others. My foray into higher education at Creighton University has kept me hopping over the last two months. But I made it through to spring break! No, I am not traveling to Myrtle Beach or South Beach or any other beach with the younger folks in my class. I am taking a few minutes to write something for this blog which has taken a back seat to writing for classes. I have written reflections on assigned movies, a letter about St. Ignatius and the Society of Jesus, mid-term essays, final essays and two research papers. It is hard to adjust my writing style to one that is more academic, but I am giving it my best shot! 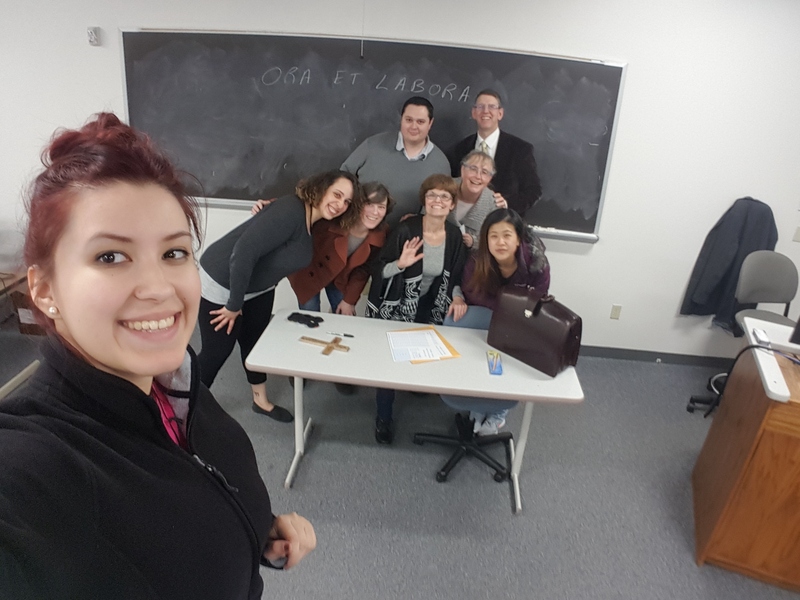 One of my classes ended this past Monday as the seven of us in Theology 110 took our final. This group of new friends were a great reintroduction to university life. For seven Monday nights we met for four hours per class and our wonderful teacher, Mr. Mueting, fed us 2,000 plus years of theology. (That is about 300 years per week but one week we covered 800!) Every week he would bring us snacks to carry us through the dinner hour. Last Monday before we sat down to take our final exam we had a potluck dinner to celebrate. We took our picture to mark the end of this required class for all students at Creighton. There we are, Nancy and I, the two fifty-somethings; Heidi, mother of eight and studying creative writing; Manny who works for a bank and has three children; Kat the social worker who brought her perspective about adolescents searching for their identities; Brisa from Mexico whose bright purple socks made us smile; and Kit, a former EMT from Hawaii who is studying to be a nurse. Life in this class was never dull especially when Mr. Mueting, a dramaturge at heart and a former contestant on Jeopardy, stood at the front and opened the fire hydrant and poured out his extensive knowledge of theology. It has been a marvelous two months. Along with this class I have been taking another class in a more traditional format: 30 students (all 20 or 21, except for me!) led by a tenured professor whose doctorate in theology is on full throttle for each Monday and Wednesday class. This class has been such a gift as I have heard affirmation about what it means to love God and love your neighbor and that those two things are in tandem and should not and cannot be separated! In both of these classes I have had good opportunities to share about the church I have been privileged to stand with in the Middle East and to bring a perspective that others might not be aware of. Even as I have been taught, I have tried to teach. I think that there is song worth singing in those quotes, and a life worth living. And if we who call upon the name of the Lord could join that choir and craft our lives to the lyrics of that song, like St. Catherine said, we would set the world on fire.